Looking for a chance to brush up on your Spanish language skills? Interested in meeting new people, learning to cook a new recipe and have a great time? Join us in the Culinary Literacy Center for a hands-on Spanish language cooking class! This class is co-taught by a Spanish speaking chef instructor and a Spanish language teacher. 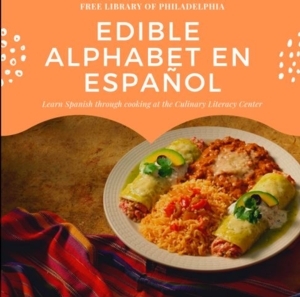 Participants will learn new vocabulary and practice reading, writing and speaking in Spanish while making a recipe from the Spanish speaking world from scratch. Tickets are $30 and can be purchased at freelibrarycook.eventbrite.com. SNAP eligible participants are provided with a free ticket, with advance communication. Please call the Culinary Literacy Center at (215) 686-5323 to receive one of these reserved tickets, no questions asked.